Monday nights at Bryant Park are known for classic movies, but this season we’re adding music to the mix before the big screen is set up on the Fountain Terrace. After Work Music with Bill McGlaughlin & Friends is a new series of free concerts by exceptional jazz and classical music performers, curated and hosted by Public Radio’s Bill McGlaughlin. The series begins on Monday, May 17 with jazz from the Karrin Allyson Quartet. Allyson is a three-time Grammy Award-nominated artist who has worked for more than a decade with an ensemble of fearless and powerfully committed jazz virtuosi. Click here to read more about After Work Music with Bill McGlaughlin & Friends. Enjoy a post concert sip and snack! To celebrate our new music series, our friends at ‘wichcraft and The Southwest Porch are offering a deal for attendees of the After Work with Bill McGlaughlin & Friends concerts. The Porch is a comfortable outdoor lounge, just steps away from the After Work stage on the Fountain Terrace, offering a unique food and beverage menu from Tom Colicchio’s ‘wichcraft. 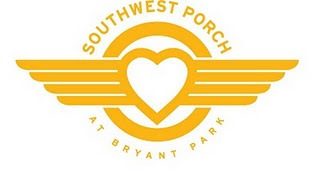 Enjoy a Monday evening After Work Music performance, then bring your concert program to The Porch and show to your waiter or bartender to receive a 10% discount off any ‘wichcraft sip or snack. The discount is valid only with a program from the current evening’s concert. 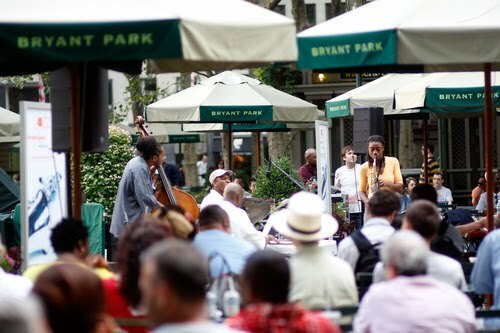 We’re also giving our @BryantParkNYC Twitter followers a chance to win free drinks and an appetizer for two at The Southwest Porch after the concert on Monday, May 17.